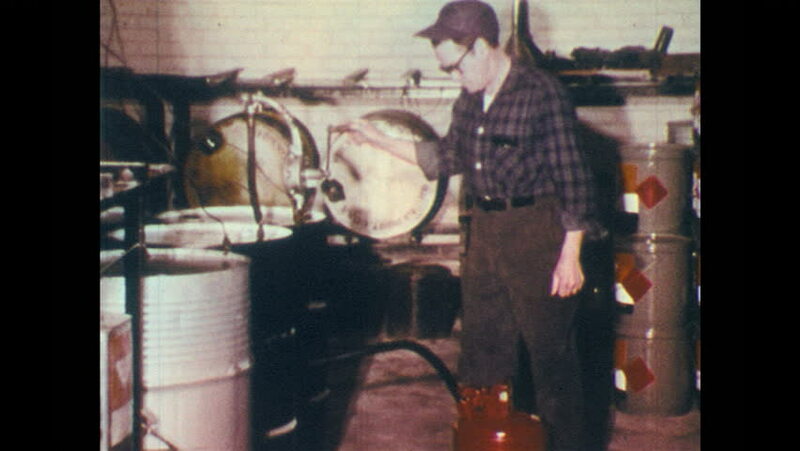 1970s: Man turns crank on chemical drum pump. Hand turns crank. Electrical grounding wires on drums. Man pours absorbent powder on chemical spill. 4k00:09Artisan worker splicing reed to use as wicker. Closeup. Morocco, Africa. hd00:211980s: Man in lab looks through window. High angle shot, men next to engine. Men with equipment in lab. Hand adjusts knob. Laser runs through screen. Man looks at laser. Men in lab. hd00:25UNITED STATES, 1950s: Man washes machine and takes pure samples for glass slide. Close up of liquid on a slide. hd00:571960s: UNITED STATES: overhead view as rocket prepares to take off. Slow motion of scaffold collapse and flames.